I’m afraid of the police. No lie: I’ve been afraid of the police for the past 10+ years due to witnessing police brutality and abuse of power. Over the past few years I have worked on this, but there is still an unconscious response of anxiety when I happen to be in a convenient store and a police officer walks in, or when I’m driving down the road and a cop car pulls in behind me, or when I witness a cop pulling over someone else, or when I have to talk to the police for any reason. How is this not frightening to see coming down your street? This shouldn’t be the case, and certainly one would think that a young white woman wouldn’t have a fear of police… but I do. 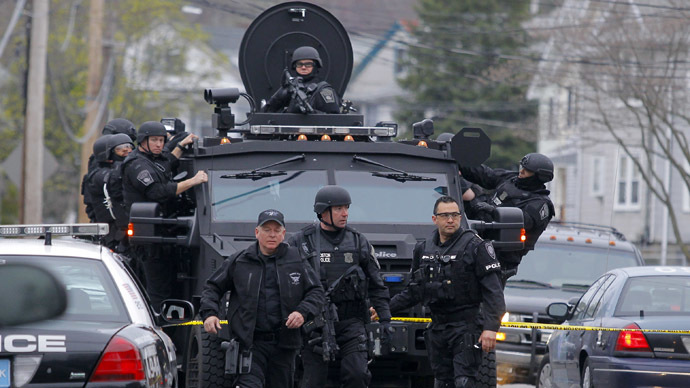 And the more and more the police forces become militarized, the more and more I worry about abuses of power. My town recently had a “Police Appreciation Parade” and my house sits on the parade route (legit, my town has like 20 parades a year, and they are all in front of my house. I never thought I would hate parades until I moved here). So, the police force in my town has a lot of money that is partially funded by a huge, stinky landfill that you can smell from my back yard (and I’m about 4 miles from it). So the police have a lot of toys. The parade scared the crap out of me. Police vehicle after police vehicle set off all of their freaking ridiculously loud sirens, with officers armed in heavy duty SWAT team armor and heavy duty, scarily huge guns (I’m sorry I don’t know anything about guns. These looked like big machine weapon guns). The alarms were so ridiculously loud, and really scared me, and my poor dog. They weren’t just the regular police siren, but were the alarms that were the high pitch beep and the one that says “This is not a test” and stuff like “Stay in your houses, we are on lockdown”. All I could think about was how re-traumatizing this probably was for veterans and people who have been in warzones. The end of the parade had camouflaged humvees and other war vehicles. The only thing that makes living on a parade route tolerable is the candy thrown to those watching the parade. Needless to say, there was no candy being thrown for “Police Appreciation Day”. Now listen. I realize that most police officers are good people, people who want to legitimately make the world a better place, and for these people, I can’t express my gratitude. I cannot imagine what it is like going into a job knowing that you could encounter dangerous situations, that maybe this is the day you don’t come home. I also can’t imagine the stress police officers are going through, knowing that now people are watching their every move and the blanket of criticism that has been laid on the police force since Ferguson (well, I mean, really since reconstruction, but Ferguson seems to be the easier chapter to look at for millennials to understand the effects of authoritarian policing and stigmatized racism). How I’ve dealt with my anxiety of police officers is consciously working on turning this fear into love. When cops pass me multiple times while walking my dog, I wave. I say hello when they’re drinking their coffee in the corner store. And I have a friend who is a police officer, and this helps me personalize police officers and reconfirm my belief that there are many good, hardworking police officers who just want to make the world a better place and improve their community. It’s unfortunate when one bad banana spoils the public opinion of the rest of the bunch, however, I can talk from experience, that after seeing police brutality up close I gained a strong distrust for police. I think this is appropriate though. If the only interaction I have with police is negative, then of course my view of all police are going to be tainted. So when there are police departments that support a culture of racism and authoritarianism, of course people in those communities are going to have a hard time believing that the harmful police methods (ie: stop and frisk) will cease. Just thought I’d keep it short and sweet. In conclusion: wear your seatbelt and download Waze while driving, and try to think of police officers as your equal, not someone who should be feared. Easier said than done.